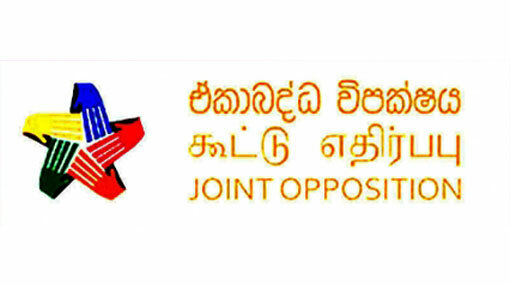 The Joint Opposition says that a Commission was never appointed to look into the important issue of the Aluthgama incident, because all the perpetrators are now in the yahapalana government. “It is therefore not surprising that conspiratorial elements are once again at work. The public should be vigilant and not be misled a second time,” the JO said in a statement issued today (14). It states that following the Sri Lanka Podujana Peramuna’s resounding victory at the local government elections, a rumor began circulating in the social media that the Bodu Bala Sena had made Facebook posts in support of the SLPP. Then articles appeared in the newspapers quoting a letter written to the press by Mr. N.M. Ameen of the Muslim Council stating that SLPP cadres had allegedly harassed several Muslim individuals in Ugurassapitiya in Kandy and Veyangalla in Agalawatte for not supporting the SLPP, it said. “If any such incidents had occurred, they should be reported to the police and dealt with,” said the statement signed by SLPP Chairman Professor G.L. Peiris, with the concurrence of the party leaders’ committee of the Joint Opposition. He said that the public is well aware of the strategies that were orchestrated before the last presidential election to alienate the Muslim community from the JO leadership.